Aziz Haniffa walks through Beyond Bollywood: Indian Americans Shape the Nation, an exhibition that explores the 'American Dream' as lived by the community stretching far behind the stereotypes such as saris and temples and sadhus,at the Smithsonian, with curator Masum Momaya. In a first-of-its-kind exhibition at the Smithsonian in Washington, DC, the world's largest museum and research complex, its Asian Pacific American Centre has formally opened Beyond Bollywood: Indian Americans Shape the Nation. The 5,000-square-foot exhibition, chronicling the Indian-American community's history in the United States from the 1700s, was thrown open to the public nearly seven years after it was first conceived. Konrag Ng, director, Asian Pacific American Centre, said at the opening of the exhibition, "The vibrant life, culture and history of immigrants from India and Indian Americans is the story of America. This wonderful exhibition deepens our understanding of the American experience as lived by the Asian Pacific American communities (approximately 17 million people in the United States, and the number is expected to climb to 41 million by 2050) who have journeyed from being exotic outsiders to being the faces and voices of the future." According to the Centre, one in every 100 Americans has a family connection to India and the exhibition explores the genesis of the Indian immigration experience in the US when they helped build the nation's railroads, worked in lumber mills, toiled on farms and established prosperous trading routes that are still in use today. Located on the second floor of the Smithsonian's Natural History Museum, the exhibition comprises of seven sections: Migration, Early Immigration, Working Lives, Arts and Activism, Yoga, Religion and Spirituality, Cultural Contributions in Food, Music, Dance and Groundbreakers. 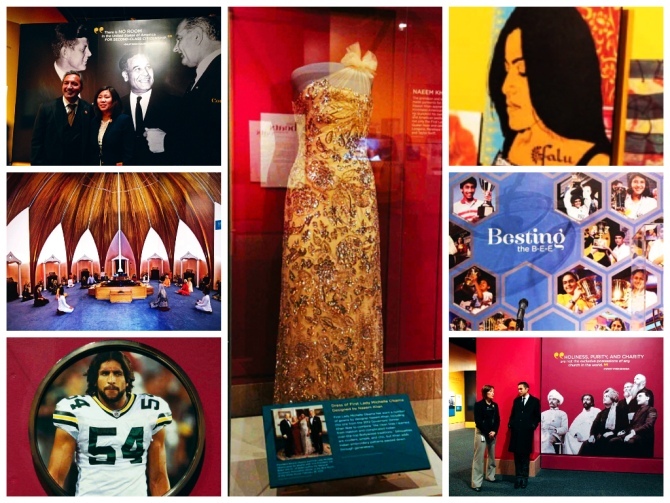 Through a vibrant collection of photographs, artifacts, art and interactive learning stations, visitors can experience the Indian-American story and explore the many dynamic roles Indian Americans have played in shaping America. the first doctor bag of Abraham Verghese, MD, author of My Own Country, The Tennis Partner and Cutting for Stone. "When the Smithsonian began working on this exhibition in 2008, as part of something called the Indian American Heritage Project," says curator Dr Masum Momaya, "there was nothing in the National Collection which has more than a million pieces that explored the history of Indian immigrants and Indian Americans here in the US." Among some of the featured artists are Chiraag Bhakta and Mark Hewko, Anjali Bhargava and Swati Khurana, Anujan Ezhikode, Ruee Gawarikar, Suraiya Nathani Hossain, Corky Lee, Annu Palakunnathu Matthew, Preston Merchant, John Merrell, Sabelo Narasimhan, Sejal Patel, Mohanpreet Singh, Vinay Srinivasan and Asha Puthli. Indian-American celebrities who adorn the various sections, include musicians, the late Pandit Ravi Shankar, Vijay Iyer, Anoushka Shankar, and Karsh Kale; actors Kal Penn, Sarita Choudhury, and Mindy Kaling; Pulitzer Prize winner Dr Siddhartha Mukherjee; Miss America 2013 Nina Davuluri; poets Meena Alexander and Shailja Patel; author Bharati Mukherjee; and chefs Floyd Cardoz and Madhur Jaffrey. The exhibition will be on display through at least February 28, 2015 in Washington, DC and then travel around the country. Beginning May 2015, it is expected to travel for up to five years to libraries, community centres and museums in the US through the Smithsonian Institution's Traveling Exhibition Service. Image: Located on the second floor of the Smithsonian's Natural History Museum, the exhibition comprises of seven sections: Migration, Early Immigration, Working Lives, Arts and Activism, Yoga, Religion and Spirituality, Cultural Contributions in Food, Music, Dance and Groundbreakers. As you make your way past the entrance where several pairs of shoes are displayed to mark the entrance to many Indian spaces be it a home, or sites of worship -- "We wanted to mark this space as well and shoes were sent in from all of the country," says Dr Momaya. 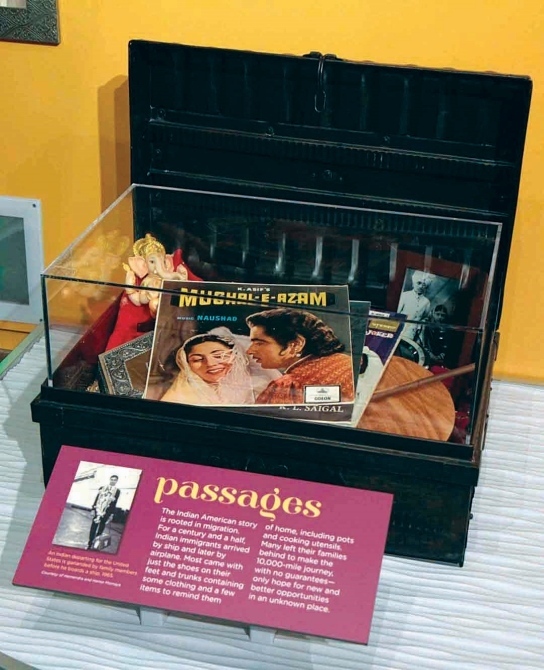 The immigrant journey begins with replicas of a trunk or suitcase, the kind immigrants brought with them in the 1950s, 1960s, and 1970s; many of them came with just once piece of luggage or a suitcase. "Some of things in the trunk are Bollywood LP covers and many immigrants reported that they brought Bollywood music to remind them of home," adds Dr Momaya. Image: An immigrant's luggage is showcased at the exhibition. At the beginning of the exhibition, a wall of photographs of Indian immigrant families show the diversity of the community -- as diverse as America itself in many ways. Dr Momaya says this was one of the most challenging questions she faced as a curator as to who are Indian Americans and hence the best way to portray this was visually illustrating the community's diversity. 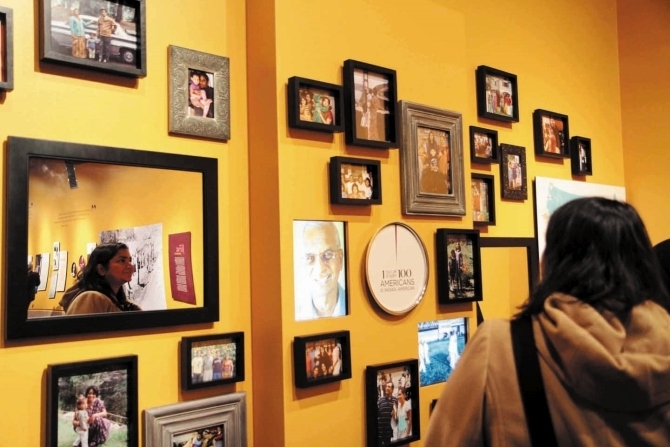 Image: A wall of family photographs showing the diversity of the community. 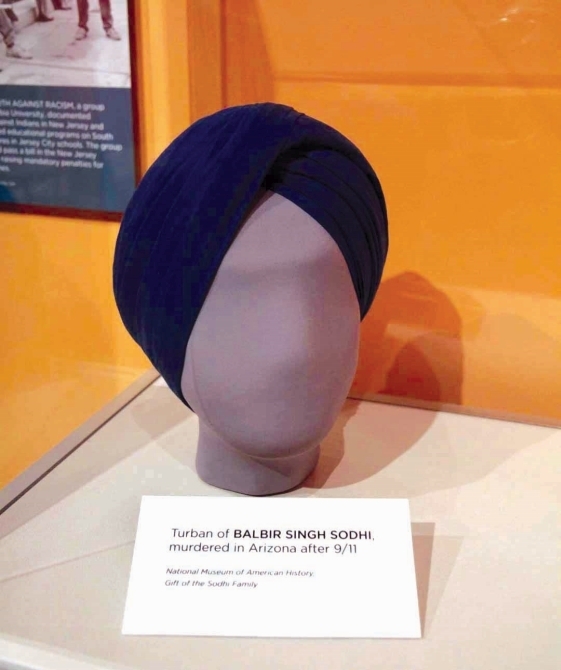 Perhaps the most powerful and emotional wall is the memorial to Indian Americans and South Asian Americans who have experienced discrimination and violence throughout US history and among the objects and narratives is the turban of Balbir Singh Sodhi. "It still gives me goose-bumps when I look at it and his family generously donated this turban and many of his other personal effects to the National Museum of American History and it is now part of the national collection," says Dr Momaya. "It is something that is really a significant moment, not just for him and his family but for many South Asian who have been targeted in various aspects of racial profiling and also experienced violent acts very directly." Image: The turban of Balbir Singh Sodhi, who was murdered in the aftermath of the September 11 attacks. 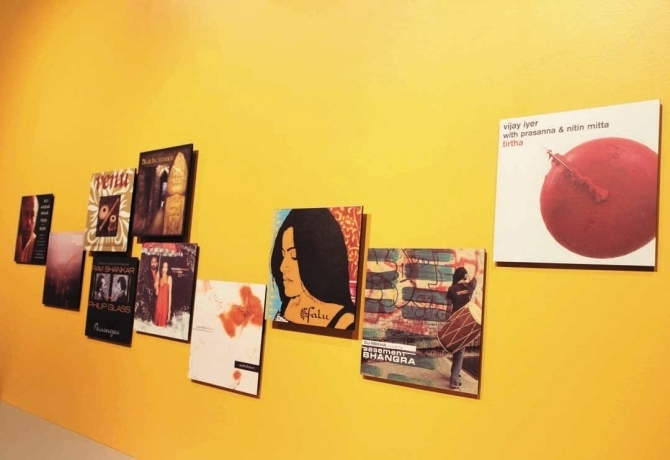 This section also comprised a number of photographs and works of art by artists who have in their work responded to some of the most difficult moments in Indian-American history such as the Dotbusters, a hate group that attacked and threatened South Asians in the fall of 1987 in New Jersey. "We thought it really important to actually put this very close to the front of the gallery to mark that it was and is something that is very much an important part of our history here in the US," says Dr Momaya. One wall is adorned with the photograph of US Congressman Dalip Singh Saund flanked by then Senators John F Kennedy and Lyndon Baines Johnson, whose signing the civil rights bill, and his progressive policies regarding immigration led to the mass immigration of Indian American professionals and their families in the 1960s and 1970s. "The photograph was shared with us by his grandson Eric Saund," adds Dr Momaya, "who dug this up among many of this grandfather's artifacts and said, 'Do you think you could use this for the exhibition?' and we said, 'Probably!'" Both she and Konrad Ng, director, Asian Pacific American Centre, said this photograph was a treasure and something "we are very proud to feature." 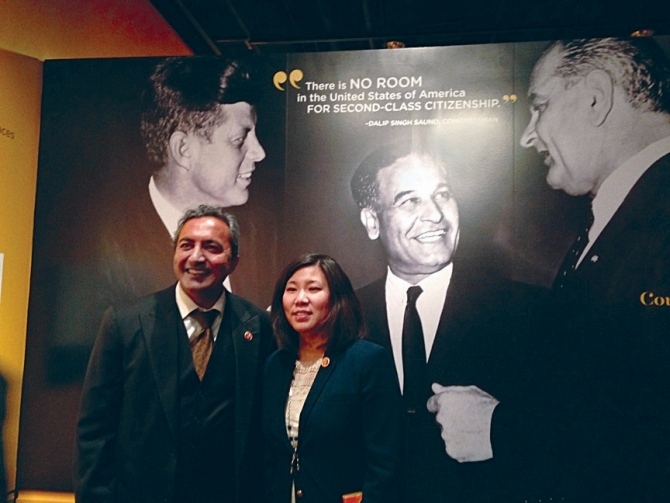 US Representatives Ami Bera, the first Indian-American physician in the US Congress, and Grace Meng, of Chinese origin, took a moment to absorb the significance of this wall. Image: US Representatives Ami Bera and Grace Meng pose against a photograph of US Congressman Dalip Singh Saund flanked by then Senators John F Kennedy and Lyndon Baines Johnson. There were also pictures of Indian and South Asian cabbies, to show, Dr Momaya had said in several previous interviews that the Indian-American immigrant experience was not just doctors, engineers, and Silicon Valley types. 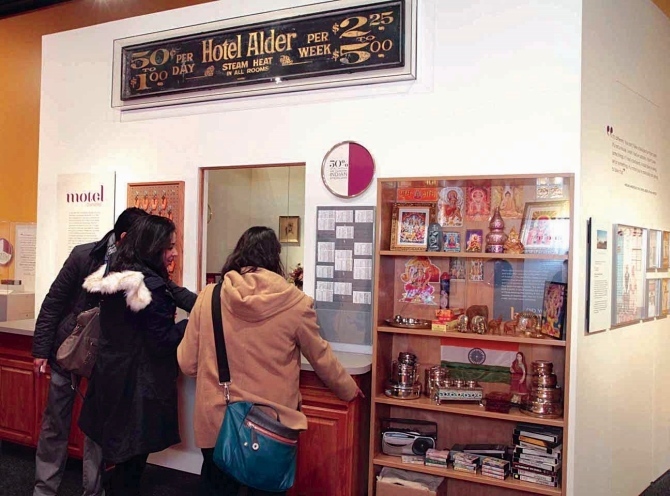 The Working Lives section is dominated by a motel lobby created by the Asian Pacific American Centre's designers, which Dr Momaya says is, "actually built from the perspective of an Indian-American owner", with the different objects and artifacts one would find, "including their traditions, customs and religious practices." The Arts and Activism section is almost wholly dedicated to youth and the explosion of young people and broadly looks at race and inequality, inequality for workers, women and LGBT people and featured are works by emerging young Indian-American artists who signature themes are posing questions -- both to the general public, but also to the community about different aspects of identity. 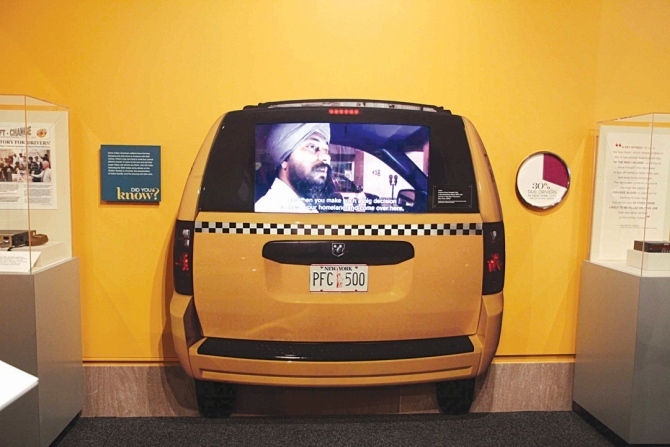 Image: A display depicting an Indian cabbie in New York. Dr Momaya was particularly proud of a series of photographs titled An Unsuitable Girl, by New York-based artists, Anjali Bhargava and Swati Khurana. "Where they take on stereotypes of gender that are found within Indian-American communities and they are asking questions about suitability -- what should a woman behave like, look like, etc." "One of the things we wanted to emphasise here is that Indian musicians have been influential in American music, not just Indian music and have changed the landscape -- the mosaic of what we know as American music today, which has always been a mix of musical traditions from all over the world. And, Indian music is a critical part of it," says Dr Momaya. In the section on cultural contributions to the landscaping of America, the wall has the range from hip-hop artists, who have contributed both to their art and activism to the likes of music from Pandit Ravi Shankar, Falu, Vijay Iyer, in all of its genres from jazz, disco, the blues, classical music and of course, bhangra, a la DJ Rekha. And, there are listening stations that allow visitors to hear samples of difference tracks by these various musicians. A dining table, which shows how Indian cuisine has become an important part of the American culinary landscape, also sits in the centre of this section and each of the plate settings feature important moments in that particular history. Thalis are on one side of the table setting while the opposite side has Corelle ware. According to Dr Momaya, while thalis are just indispensable to the psyche of the community, "Many Indian immigrants who came to the US in the 1960s and 1970s and 1980s brought Corelle ware types of dishes and some of them gave it to their children when they went to college." Simulated in the dining table are also the different types of Indian spices with an explanation of their use and versatility. Image: This display shows how Indian cuisine has become an important part of the American culinary landscape. Featured among the Groundbreakers -- incorporating spirit, mind, and body -- are astronauts Kalpana Chawla and Sunita Williams, Nobel Prize-winning scientists, and, of course, the First Lady's dress, for which the Smithsonian had been in negotiations for more than a year before they could borrow it for the exhibition. The section also features athletes, who have achieved the highest accolades in their respective sports. This section, Dr Momaya says, would make "people of all ages happy to see that Indians are not just doctors and engineers but also award-winning athletes." 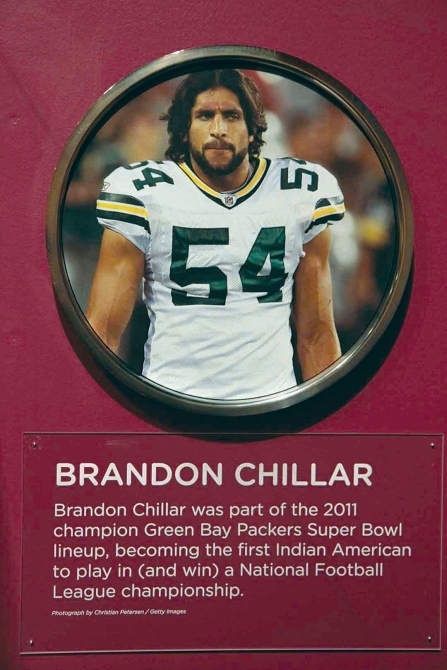 Image: Brandon Chillar, one of two players of Indian-American descent to ever play in the NFL. "Aside from the Inaugural Ball gowns that are shown in the National Museum of American History," says Dr Momaya, "it's rare to be able to show a dress of a First Lady, let alone a sitting First Lady." "As curators," she adds, "we always have a choice how we present different types of sensitive and charged topics. And, one of the things that I elected to do is instead of necessarily hitting audiences over the head with text saying 'Think about race, or identity, or inequality,' actually let the works of art pose those questions to the viewers in different ways." 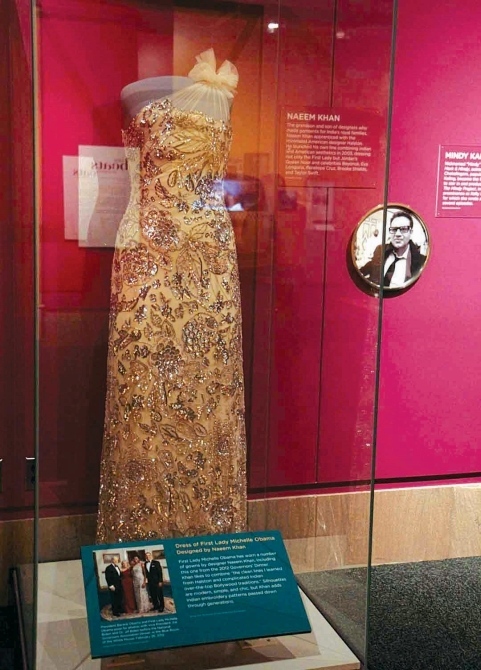 Image: A dress worn by First Lady Michelle Obama designed by Indian American Naeem Khan. And, what exhibition on the Indian-American experience would be complete without the contribution of Indian religions, spirituality and yoga, including the yoga stylings of the controversial Bikram Chaudhary. "This particular section was very interesting for me as a curator," says Dr Momaya, "because religion is a complex topic to treat in a museum -- even within any given religious tradition or faith there are contesting views on how to describe it and display it and how to talk about it." "One of the things we did was go around the country interviewing young people about their faith -- we asked them to describe it and also talk about it, what it means to them." "What you see displayed are different quotes of young people talking about their religion in their own voices. There are nine faiths that are practiced by Indian Americans and they are all represented here." There is a monitor that shows photographs, moving slides and videos from different congregations, representing everything from rituals to prayers to contemplation to teaching children traditions. Also represented are the different architectural contributions, because, as Dr Momaya explains, "As many as you know, about 100 years ago, it would be uncommon to see a temple or a gurdwara or mosque in the American architectural landscape in small towns or urban areas. But that is not true anymore today, so we wanted to recognise that very visual contribution as well." An interesting structure in the centre of this section, is one that discusses the history of yoga in the US and the walls details some important moments in its history. It also features the recreation of a lotus room of the Yogaville Ashram in West Virginia -- one of the first institutions to teach not just the practice of yoga, but also the philosophies behind it. This is also, says Dr Momaya, "A contemplative place, where people can come in and sit and try different yoga asanas and it is surrounded by silhouettes in case people want examples." 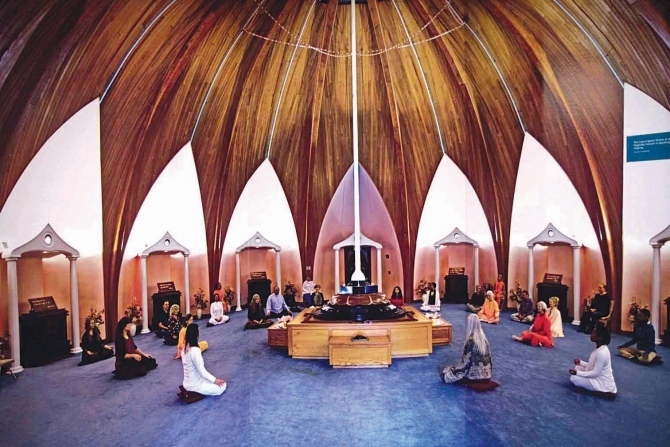 Image: A recreation of a lotus room at the Yogaville Ashram in West Virginia. Any discussion of Indian spirituality is incomplete without Swami Vivekananda. There is a large photograph of his, though some may argue that his influence and gravitas is not given sufficient prominence. Another highlight is also a beautiful photograph of Swami Satchitananda opening the Woodstock Festival in 1969 in a sense lending credence to the counterculture associations between yoga and Indian philosophies in the 1960s. 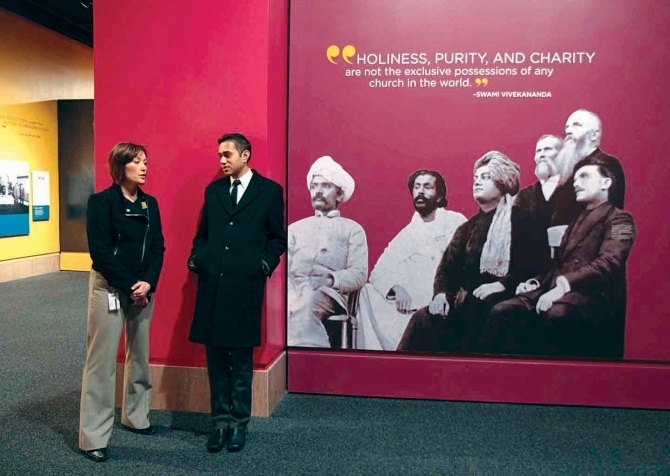 Image: Visitors pose against a photograph of Swami Vivekananda. 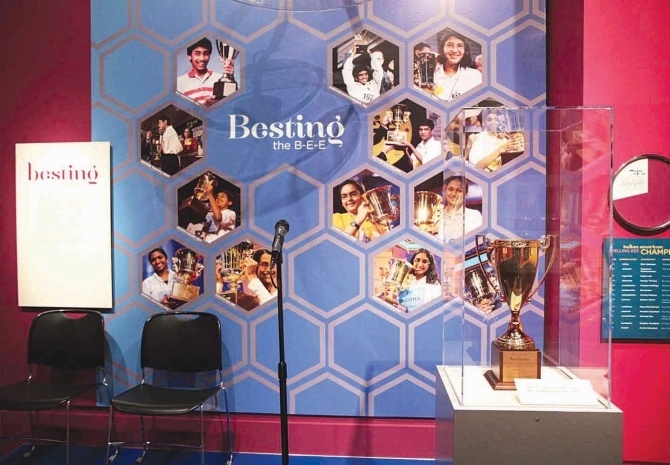 Needless to say, there is a special corner where the National Spelling Bee stage has been recreated recognisng the more than 73 per cent of National Spelling Bee winners since 1999 of Indian-American origin -- a remarkable statistic, considering they are just one percent of the US population. Also, on display by the side of the stage, is the trophy won by Balu Natarajan in 1985. And, as you leave the exhibition by the hallway (although you can enter through this hallway too) are life-size photographs by John Merrell of California, whose interest in different forms of Indian dance had prompted him to traverse the country photographing a number of these dance forms and traditions. "When we were designing the exhibition, we had children in mind," says Dr Momaya, "but also wanted to be able to use the reflective surface for people to see themselves among these very traditional forms. These are all Indian-American dancers in the US -- these are not taken in India." "So, one of the things that is really stunning in addition to the beauty of the photographs, is really the facial expressions and the costumes and the hand gestures and things that are communicated in these different poses. It is something that we wanted to either introduce people to the exhibition with or have them leave with, when walking through the gallery space." Image: A recreation of the National Spelling Bee stage. The trophy won by Balu Natarajan in 1985 is also displayed.